ATHLETICS: THE final fixture of the track and field season resulted in some scorching performances from Woking athletes. The occasion was the Surrey County Combined Events & Relay Championships, which were held over two days at the David Weir Leisure Centre in Sutton. Star billing went to the women’s under-17 4x100m relay team, who took gold in a new championship best performance of 50.41 seconds. 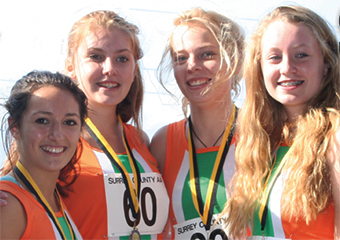 The team of Nia Kelly, Chloe Roddy, Katie Barrett and Katrina Francis, who ran a brilliant anchor leg, came home clear winners, beating two of the biggest clubs in the south east – Sutton & District and Kingston & Polytechnic – in the process. The same quartet later went on to win the 4x200m relay setting a new club record of 1.49.41 as they did. Competing over two days in the men’s U17 octathlon, Rory Kelly again produced an impressive display of his versatility, taking gold with more than daylight between him and fancied Shaftsbury Barnet star Dylan Carlsson-Smith. Kelly, who threw a personal best of 12.58m in the shot, is coached by dad Paul, who is himself an active and successful Masters athlete. In the men’s decathlon Woking’s Kaspars Kazemaks (5,756 points) and Roy Chambers (5,187 points) took the silver and bronze medals, respectively. On Saturday, the club was represented by Peter Evans in the Masters pentathlon and he managed to scoop top spot. The U17 quartet of Dan Farley, Anton Goransson, Daniel Benham and Jason Dwumfoe then narrowly missed setting a new club record when they finished second in the 4 x 100m. Hours later, the same four men put on a blistering performance to take the Gold medal in the 4 x 200m and, to their delight, set a new Woking Club record of 1.39.48 – beating the previous 1991 record by just two hundredths of a second. Given that Dwumfoe was carrying a slight groin strain, this was a hugely impressive performance and the anchor leg from Goransson was determination personified. Alexa Eichelmann, who this season has carved a big reputation for herself in the Pole Vault, took silver in the Girls U/15 Pentathlon. Competing against a total of 19 other athletes, Alexa displayed real commitment to the cause and achieved a new personal best in the Long Jump (4.75m) one of the five disciplines in the Pentathlon. The Boys U13 relay team of Kenny Ball, Angus Caruth, Reef Cawthraw and Jonathan Efedje took silver medal in the 4 x 200m in a time of 2.05.72. This was a much needed boost for this young team, who earlier had been disqualified from the 4 x 100m for a baton-change foul. Woking’s girls U13 team of Aimee Mattingley, Lucy Eaton, Niamh Carey and Tumi Araga, despite only finishing fourth in their 4 x 100m relay, set a new club record with a time of 56.46, beating the previous record of 56.70, set way back in 1997. With Tumi Araga unable to run in the 4 x 200m, she was replaced by Izzy Leikis and, along with the other three 4 x 1 girls, the team took the bronze medal in a time of 2.01.75. A total of five Gold, Four Silver and Two bronze medals, along with two Championship performances and four new Club records, resulted in this being the most successful outcome in years for Woking AC at this event. These athletes will all now take a well-earned break for a few weeks before the start of winter training in preparation for next season.